CORRECTIONS: There is NO "Chair" of the MC Progressive Alliance. Mary Belle Feltenstein was left off lists of steering committee members. The newsletter erroneously identified a Chair of the organization, even though no one has been elected to that role. The Steering Committee is drafting a Charter and Bylaws for the group - subject to membership ratification. After that, there may be officers elected in addition to the Steering Committee, but there are no Chairpersons as of this time. 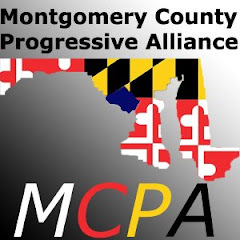 At a general meeting on March 10, members of Montgomery County for Kerry voted to dissolve the organization and create a new one, the Montgomery County Progressive Alliance (MCPA). The following mission statement was adopted: Our mission is to promote progressive values, policies, and candidates for elected office in Montgomery County, throughout Maryland, and nationally. The following were elected as members of the temporary steering committee: Mary Belle Feltenstein, Robert M. Colton, Mike Hersh, Art Fabel, Naomi Bloch, Tom Colbert, Win Allred, and Ben Vaughn. Thanks to outgoing steering committee members including Debbie Coburn, Hal Ginsberg, Ned Preston and others whose leadership and dedication cannot be replaced. The next general meeting will be at 7:30 on Thursday, April 21, 2005, at a location to be announced. The name of the organization changed, and some of the people who built up the organization and showed the way to the 2,000+ volunteers are taking on new endeavors. But the goals remain the same. Start at the local levels and build a country where the voices of everyone are heard and investments are made in people, education, and health. That may mean different things to different people but we want a government that listens and then acts to maximize the benefit to everyone and plans for the future. So that is what this organization is about: Listening to everyone, connecting like minded people and organizations , and using these coalitions to help our present elected officials and future elected officials govern with true compassion.